We can find flowers on this rose in January, and it survives the hot summers as well. 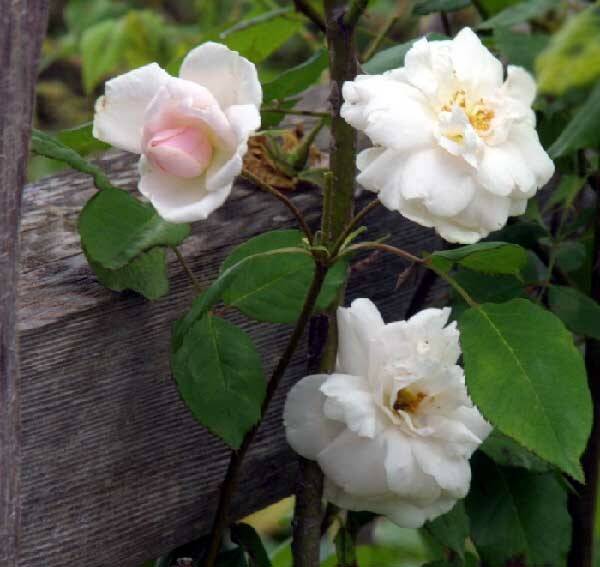 The blooms are cupped and double and are a creamy white. The pink color that some sources mention has not been evident on our plant, probably due to the hot sun fading the blooms. The canes tend to grow straight up, so it needs some strong help to keep it growing horizontal. It can grow up to 15 or 20', or can be pruned to a large shrub. Bred in Lyon, France in 1879 by Joseph Schwartz and family.